The skin is the largest organ in the body, always visible to the outside world. When changes in your skin caused by vitiligo take a toll on your self-confidence, you should consider seeing a dermatologist. There are many treatment options available to improve the white patches vitiligo causes. 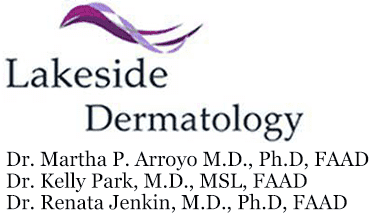 At Lakeside Dermatology offices in Libertyville and Gurnee, Illinois, adults and children achieve great results treating this condition with light therapy and medications. Call to schedule your initial consultation today. Vitiligo is a skin condition that happens when cells that produce pigment – or color -- die off or stop working. No one knows why it happens, but experts believe it involves heredity, the immune system, or a trigger event like sunburn or stress. The signs of vitiligo include white patches of skin, loss of color inside the nose or mouth, early graying of the hair, eyelashes, or eyebrows, and a lightening of the retinas. Vitiligo is also connected with an overactive thyroid in many patients. The telltale patches of vitiligo can appear in one spot on the body or throughout the body in random areas. Vitiligo affects men and women of all ages and skin colors. For most people with vitiligo, patches first appear before the age of 20. Dr. Arroyo can’t predict how your vitiligo will progress, but she can significantly improve the appearance of patches you already have. What are the complications from vitiligo? Physically, people with vitiligo are prone to problems with the ears and eyes, including partial hearing loss and inflammation of the iris. Dr. Arroyo watches you carefully for any changes as your vitiligo progresses. Also, because the light patches of skin lack pigment, patients with vitiligo are more vulnerable to the sun. They should use sunscreen regularly to prevent burning and skin cancer. Just as important as the physical effects of vitiligo is the emotional impact it has, especially for children and teens. Vitiligo is a chronic disease that progresses unpredictably, leaving many patients feeling angry, depressed, and worried. Dr. Arroyo recommends seeking emotional support beyond dermatological treatment for patients debilitated by vitiligo. Many people have full, vibrant lives in spite of vitiligo. But if vitiligo holds you back from living the life you want, cosmetic dermatology can help. To discuss treatment, call to book your appointment today. Read More about some of our Services!